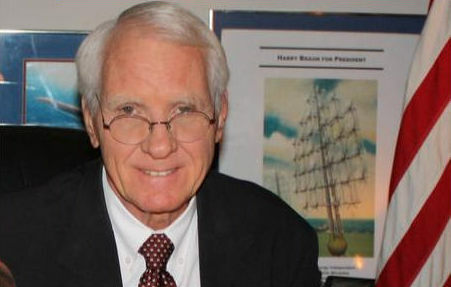 Harry Braun is the CEO and Senior Scientist of Mesa Wind LLC, a wind energy development company, the Phoenix Project Foundation and the Science News Network. He is also founder of the Democracy Amendment USA 527 Political Action Committee and has been an Advisory Board Member of the International Association for Hydrogen Energy (iahe.org) since 1981. His Publications History provides an overview of his past Congressional campaigns against John McCain in 1984 and Jay Rhodes in 1986, as well as his two prior Presidential campaigns. His Wikipedia article is listed under “Harry Braun,“and his Presidential Priorities document can be accessed with this link. The picture behind Mr. Braun is of a sea-based “Windship” hydrogen production system that was developed by engineering professor William Heronemus, who was the former superintendent of shipbuilding for the United States Navy. Such systems could make America energy independent while providing a vast sanctuary for the fish and other marine organisms that are being driven into extinction from chemical contamination and destructive “free market” fishing practices. Click here for Harry Braun’s formal video announcement. Click on “VIDEOS” at top for Braun’s policy videos. Braun’s amendment will empower the majority of citizens who are registered voters to approve all laws and Supreme Court decisions, thereby replacing the bribery-based American Republic and its highly toxic Oil & Nuclear Economy that is making the Earth uninhabitable, to a majority-rule Democracy as soon as possible so a solar-sourced Hydrogen and Cannabis Economy that is both poison-free and inexhaustible can be implemented by 2020. This is only possible because the the technology to make hydrogen from water with electricity has existed since the year 1800, which is why the world’s first automobile built in 1807 was using pollution-free electrolytic hydrogen made from water and not toxic gasoline. 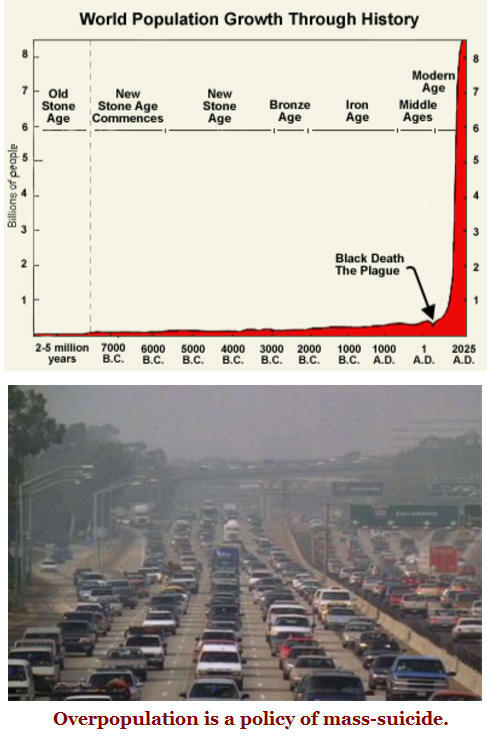 Given the exponential nature of both the problems and solutions, humanity is rapidly accelerating towards both a technological “Utopia” of regenerative molecular medicine that is already regenerating human cells and organs, as well as an ecological “Oblivion” scenario that scientists have referred to as the Sixth Mass Extinction event in the Earth’s history that is now entering its final exponential stages — which means it is almost over. 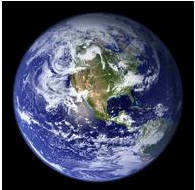 In spite of these well-established scientific facts, none of the other presidential candidates are even aware of the mass-extinction problem, much less what to do about it — which will involve hiring millions of people immediately to mass-produce and operate state-of-the-art wind and hydrogen-powered “Lifeboat” and larger “Arcology Ark”organic indoor food and cannabis production systems in every community that will be able to operate in spite of the Oil Age-induced climate change chaos that is already destroying and contaminating food production and water systems worldwide. 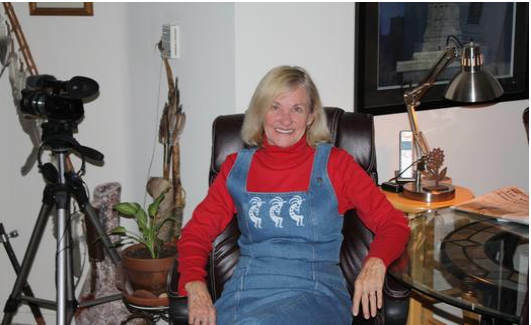 It is important to note that any existing home or building can and should be modified to become a Lifeboat organic food and biochemical production system, which requires a precisely-simulated daylight lighting system that is critical for the plants as well as the production of vitamin D3 in humans and other animals, which is not a vitamin at all, but a critical protein that is made from the 290 nanometer ultraviolet wavelength of sunlight, which is needed by every cell in the body. Yet most American’s are seriously deficient in D3 because they spend most of their solar day working indoors, and the so-called vitamin D “snake oil” pills that millions of Americans now spend billions of dollars on each year do not work, according to the Institute of Medicine, because they are not the D3 protein that is made in skin and liver with the ultraviolet wavelengths found in sunlight. This underscores the fact the oil-owned pharmaceutical drug corporations, who refer to their toxic drug’s (including Aspirin) as “medicine,” are mostly a fraud, and they are bankrupting the USA with trillions of dollars in unfunded liabilities. And all of this was completely unnecessary because real medicines are made from plants like cannabis that farmers used to grow before it was made illegal by oil company lobbyists in 1937 with no recorded vote in either the House or Senate, and over the objections of Henry Ford and the American Medical Association. Nor was a Constitutional Amendment passed that was required to make alcohol illegal, as per Article 1 Section 8 of the U.S. Constitution. Details are in a YouTube film, “The True History of Marijuana,“ produced by the British Broadcasting Corporation (BBC) which should be viewed by every voter in order to end the unscientific and unconstitutional cannabis laws ASAP. An equally riveting and related must-see documentary is All Wars are Banker’s Wars. Note the new immigrants in red are legal immigrants to the U.S. At present, no one knows how many illegal immigrants are in the U.S., and Braun’s proposal is to simply require utility companies to determine the citizenship status of their customers, which would quickly determine the real numbers. Hydrogen made from water with electricity generated by wind and other solar technologies is the only “universal” fuel that is completely renewable, non-toxic and pollution-free. At the end of the DVD, there is a remarkable ABC News report about a hydrogen home built by a Iowa farmer who only had a 6th grade education because his father’s death. BMW has been developing liquid hydrogen-fueled automobiles like those shown above for many decades, although the world’s first hydrogen fueled automobile was developed in 1807 in Switzerland. Thousands of hydrogen-fueled vehicles have been in use since the 1800’s, and at present, hydrogen-fueled engines and vehicles have been developed by Mercedes Benz, General Motors, Ford (which currently hold’s the world’s record for the world’s fastest hydrogen powered car), Hyundai, Toyota and Honda, which has also developed a home or community hydrogen production and refueling station. However, as Henry Ford demonstrated in the 1920’s, the least expensive hydrogen, plastics and ethanol came from cannabis crops, which Braun’s research has documented is why cannabis was made illegal in 1937 by oil company lobbyists led by oil baron Andrew Mellon who changed the name of cannabis to an unknown slang term “marihuana” (spelled with an “h”) to confuse the public while cannabis was made illegal with no recorded vote in either the House or Senate, and over the objections of the American Medical Association. 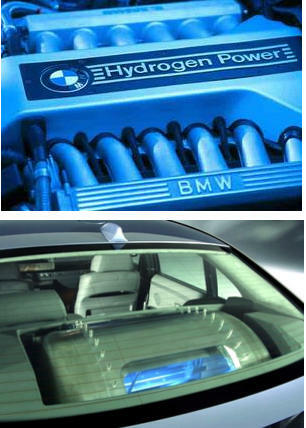 BMW’s liquid hydrogen fuel tank is shown above and BMW, NASA and Air Products & Chemicals, the largest U.S. hydrogen production and transportation company, all rate gaseous and liquid hydrogen much safer than gasoline or other hydrocarbon fuels because hydrogen is non-toxic as well as being the lightest element in the Universe. 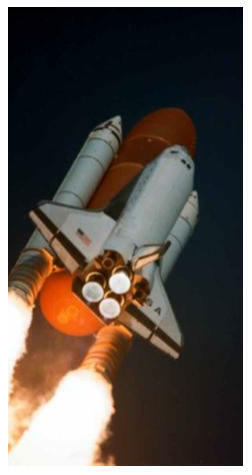 Thus no toxic smoke is generated and the hydrogen dissipates in seconds in the event if a leak or spill. Gasoline, by contrast, is highly-toxic and is heaver than air, thus it will wick and stick to clothes and skin while it is burning, although most victims die from inhaling the toxic smoke. 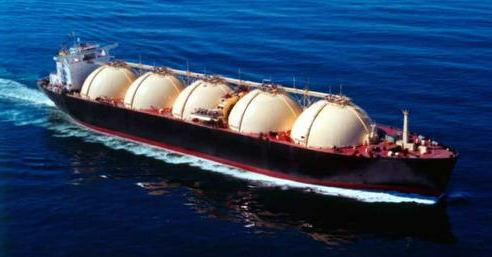 This safety consideration is especially important in aircraft and large cryogenic liquid hydrogen storage tankers like the one shown below, which was built in the United States by General Dynamics corporation in the 1970’s. Even in a worst-case accident, where all of the hydrogen was released, no toxic chemicals would be released into the air or water. This is in contrast to the Exxon Valdez toxic oil spill over 20 years ago that has never been “cleaned up,” because such so-called “clean-ups” are not possible. This is due to an immutable law in physics called “diffusion,” which takes place every time cream is poured into coffee. If chemical poisons are put in the cup, they diffuse just as rapidly as the cream, which is why every man, woman and child worldwide has been contaminated, including the unborn, who soak in a witches brew of chemical poisons from the point of conception. 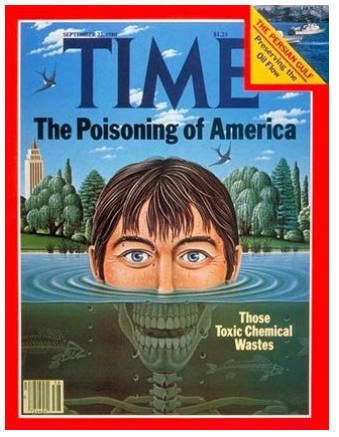 This “Poisoning of America” was featured on the cover of Time magazine in 1980 (below) and in Dr. Sanjay Gupta’s Toxic America report on CNN. Sanjay Gupta, who is a professor of medicine, produced the two-hour Toxic America documentary in 2010, where EPA Director Lisa Jackson acknowledged that over 85,000 of the most toxic oil-based substances known, such as gasoline, diesel fuel or the thousands of pesticides, were all secretly excluded from EPA review when the agency was established in the 1970’s. Thus these poisons have been increasingly mass-produced for the past 100 years, which is why they are now in the blood of every person and animal worldwide. 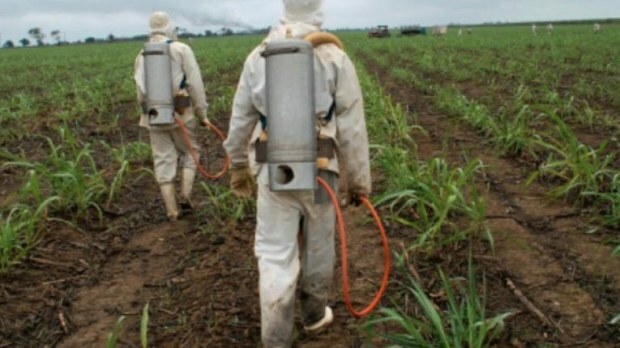 Once these toxic chemicals are in the blood, they travel to every cell in the body where they dissolve the critical protein molecules on contact into super-sticky “amyloid plaques,” which are the only possible molecular mechanism that is causing a wide-range of epidemics, including diseases such as cancer, autism and dementia that alone are in the process of bankrupting the U.S. 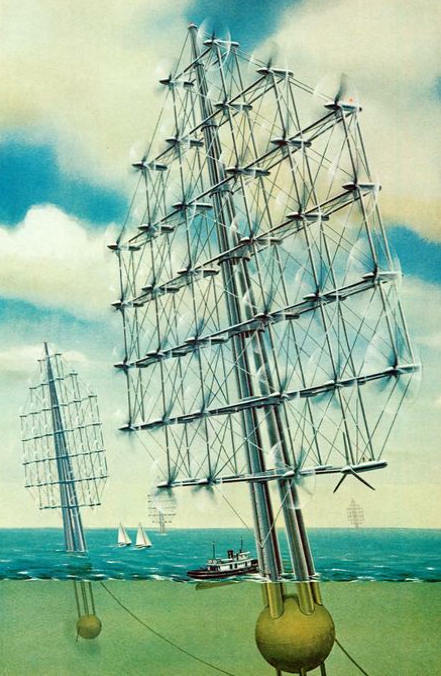 The “windship” hydrogen production shown above in color was developed by Heronemus, but the image was created and published by theNational Geographic Society in 1975. 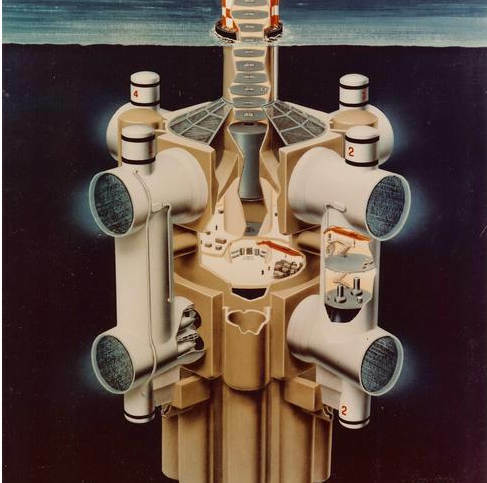 The system cutaway above was published in Popular Science in 1977 shows the spherical hulls where the crew would live and work, and by having all of this hydrogen production and storage equipment below the water, a vast sanctuary will be provided for the fish and other marine organisms that are in the final stages of being hunted into extinction from the mindless “free market” forces. 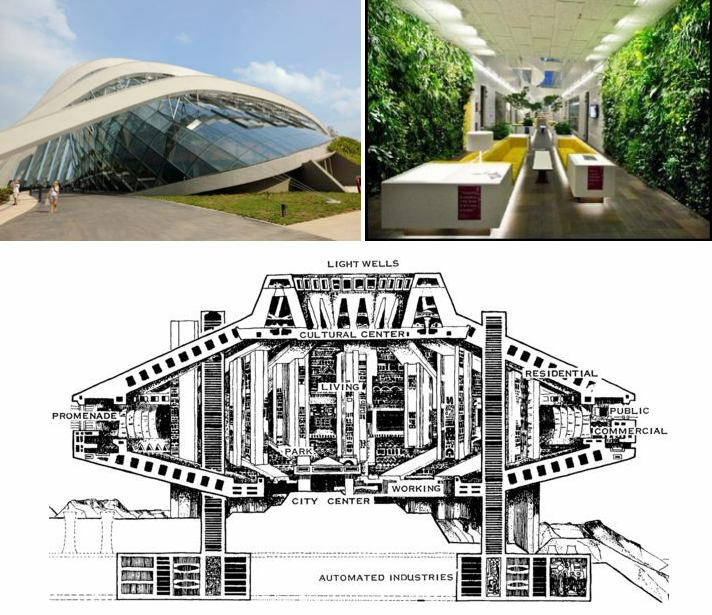 Both images were published in Braun’s Phoenix Project book, which is now available as an ebook on the Phoenix Project Foundation ebooksgtore website. 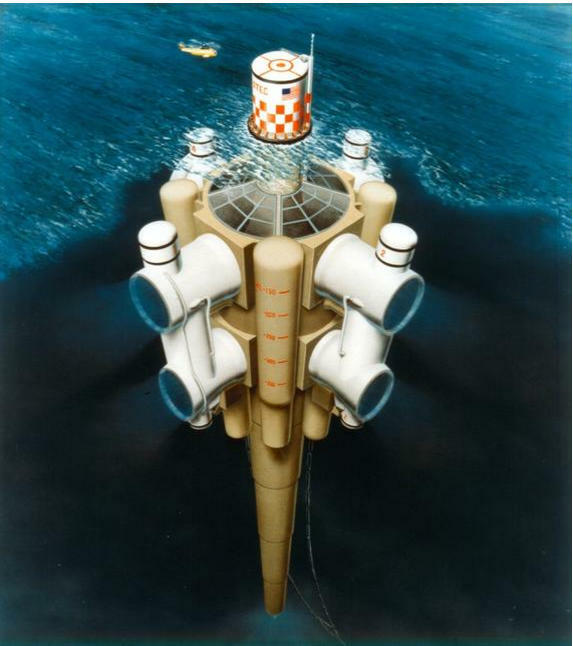 Ocean Thermal Energy Conversion (OTEC) systems were first conceived in the 1800’s by a French physicist who understood that the temperature differences between the surface of the seawater, which is the largest solar collector on the Earth, and the near frigid cold nutrient-rich deep seawater that lies 1,500 to 2,000 feet below could power heat engine cycles to create electricity. OTEC systems or wind systems alone could produce enough hydrogen from the seawater to permanently replace all of the highly-toxic fossil and nuclear fuels now used worldwide while generating vast quantities of seafood from the nutrient-rich water that is pumped up and released near the surface. 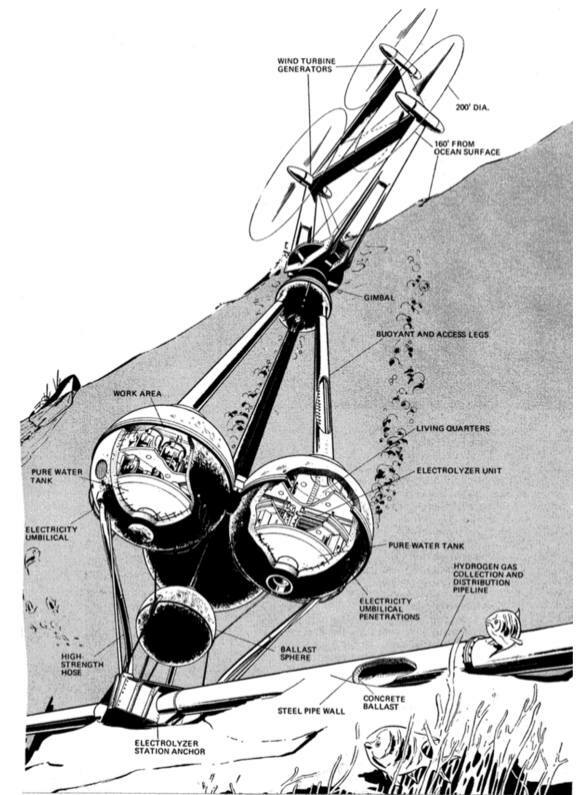 A cutaway of the Lockheed design from the 1970’s is shown below, and a link to an excellent Lockheed OTEC video can be accessed from Lockheed’s website. 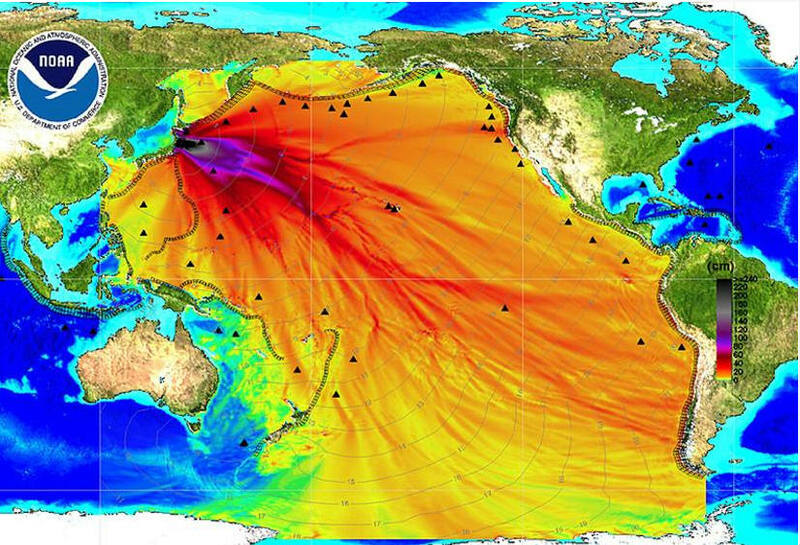 All of the existing nuclear reactors in the U.S. are of the same design as the one’s that failed catastrophically in Fukushima, Japan, and this accident is far from over. It is why all of the existing reactors should be decommissioned with wartime speed. The image below on the left was taken in 2012, whereas the image on the right was taken in 2014. 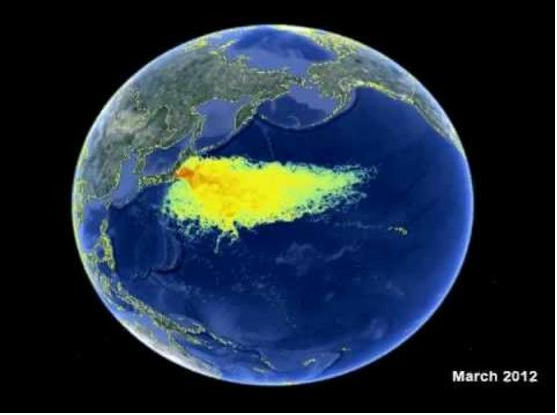 The human population explosion has been completely ignored in the immigration debate, yet it is one of the major factors that is causing the Earth’s Sixth Mass Extinction event that is now almost over, which is why it is critical to Take Action Now. 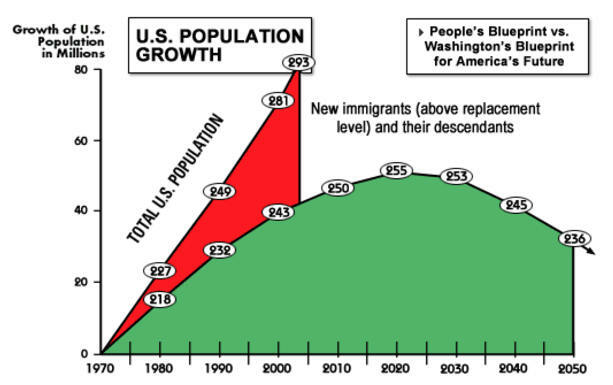 Given this harsh reality, there is simply no need for any new immigrants to the U.S., which has nothing to do with race or culture, but the vast poverty that already exists throughout the U.S. and the exponential laws of physics, explained by physics professor Alpert Bartlett. Human beings are exactly like malignant cancer cells in the body that are growing out of control until they kill the host organism. While abortion is an unpleasant thought, so is a Mass Extinction event. But in addition to problems of overpopulation, there are staggering costs involved. While a wall may be part of the answer, Braun’s recommendation to the majority would be to redeploy the 28,000 U.S. soldiers who are defending Korea’s borders to the U.S. Southern Border, and rather than spending $60 billion to bomb people for Oil Wars abroad, hire millions of Americans to establish and operate a major base along the entire Southern border that will be integrated with the indoor “Arcology Ark” food and chemical production facilities that will generate billions of dollars in revenue annually. Braun also Advocates adopting Canada’s immigration policy that keeps illegal immigrants out of Canada without a wall, because Canada does not provide citizenship or financial benefits to such individuals, including welfare, health care or educational benefits. Braun is also recommending ending the drug wars against natural substances like cannabis and morphine, which would end what the FBI characterized as a $100 billion-a-year Central American Drug Gang, that now commits over half of all of the violent crimes in the U.S. The FBI reports they have already arrested over 1.4 million Central American gang members, but they have no idea of how many millions of gang members are in the U.S. This is in contrast to the estimated 30,000 members of ISIS. But given the pictures of the gang “Caliphate” members shown above, who were arrested with heavy automatic weapons, including 50 caliber machine guns, Braun would legalize cannabis and all other natural and non-toxic substances like coca leaves immediately. The Supreme Court confirmed and clarified this restricted interpretation of citizenship in the 1884 Elk vs. Wilkins case, where John Elk, a member of an Indian tribe born on American soil, could not meet the allegiance test of the jurisdictional phrase because he “owed immediate allegiance to” his tribe, a vassal or quasi-nation, and not to the United States. The Court held Elk was not “subject to the jurisdiction” of the United States at birth. The phrase “subject to its jurisdiction” was interpreted to exclude citizens of foreign states born within the United States, thus the Court concluded that the status of the parents determines the citizenship status of the child. Given this Supreme Court rulings in 1873 and 1884, it is not necessary to modify the 14th Amendment . What is required is a government “of the people” that will enforce the existing immigration laws. 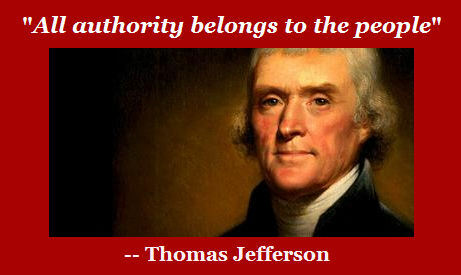 At present, however, the existing U.S. federal and state “Republican”governments are all bribed by lobbyists who have their own interests and this will not change until the majority of citizens ratify the Democracy Amendment as the 28th Amendment to the United States Constitution, with the Article V Citizen Ballot that can be downloaded from the DemocracyAmendmentUSA.net website. Given the Exponential Age in which we are now living, humanity is accelerating towards both a technological “Utopia” of a Hydrogen Age that will allow the remarkable (i.e., exponential) progress in regenerative molecular medicine to continue, essentially giving birth to a new species, which Braun refers to as Homo Immortalis, where aging and disease will be eliminated. Indeed, the specific protein “GDF11” was discovered by investigators at Harvard in 2014 that switches on the stem cells that are already in the cells doing nothing. That is just a small example of the power of the universe of proteins within us that are so complex that no supercomputer is yet powerful enough to understand and characterize their biochemistry. This is because the proteins are a 4-billion year-old-civilization that is so advanced that they have created and operated every living organism from the simplest virus and bacteria to each and every human being. Proteins create, store and communicate as needed each and every memory, and as such, the proteins are clearly our “creators” and yet we are melting them down into super-sticky blobs of what are referred to as “amyloid plaques” that are at the molecular level causes a broad spectrum of tragic diseases, including autism, Alzheimer’s and the dementia diseases, as well as cancer and heart disease. In Braun’s view, that is the price for dissolving our biological creators. And the Oil Industrial Complex is responsible for this mass extinction event. Given immutable physics laws of diffusion, which occurs when cream is poured into coffee, every mothers womb is now contaminated worldwide with a witches brew of thousands of chemical and radiological poisons that have been created from the Oil and Nuclear Industrial Complex, which was never needed. While Utopia may still be possible, the Oil Age-induced Oblivion scenario is now entering its final exponential stages, which scientists refer to as the Sixth Mass-Extinction event in the Earth’s 4-billion-year-old-history. No other presidential candidate is even aware of these biblical-scale problems, much less what to do about them, while we hopefully still have time to make a difference. Indeed, Hillary and all of the Republican candidates are financed by the oil and nuclear industries, which would be illegal in a real Democracy. Due to the economic and environmental State of Emergency that now exists in the USA and worldwide, America cannot afford to wait until the next unverifiable election to shift from oil to a solar-sourced hydrogen economy. That is going to require the majority of American citizens in 38 states to download the Article V Democracy Amendment Citizen Ballot from the Democracy Amendment USA.net website and mail it to their Secretary of State ASAP, as though their lives depended upon it — because they do. Please go to the “Contact Us” page and leave your name, state and email address, so you will receive our campaign announcements and be able to help coordinate and organize our Computer Coordinated Correspondence Committee (C4) in each state to help communicate the urgent need to ratify the 28th Amendment for Democracy with the verifiable Article V Citizen Ballot with wartime-speed. This explains why none of the electronic news networks have even mentioned that Hilary Clinton’s major accomplishment as Secretary of State was her Global Shale (Fracking) Initiative that involved overthrowing governments in Libya and Ukraine, while promoting the interests of highly-toxic oil and uranium corporations worldwide, including Halliburton, Exxon and Chevron. The Washington Post reported on February 18, 2015, that the Clinton Foundation received nearly $2 billion in “donations” from such multinational corporate interests while Hillary was supposed to be working as Secretary of State, which was not reported on the Clinton Foundation IRS tax returns or to the Obama administration until it was discovered five years later as the Clinton cover up was increasingly exposed. And according to the IRS: “Any person who willfully attempts to evade or defeat any tax imposed … shall, in addition to other penalties provided by law, be guilty of a felony.” Except the Obama so-called Justice Department has thus far refused to prosecute the Clinton’s, who were all co-conspirators in this massive cover up that makes the Watergate cover up look pathetic by comparison. But in Washington D.C. and in State Legislatures, such political corruption is business as usual in the American Republic, which is why vast quantities of chemical poisons that now arrive in the wind and rain are in the blood of every man, woman and child worldwide, including the unborn who now soak in a witches brew of poisons from the point of conception. The scientific community is alarmed but powerless as humanity accelerates into a mass-extinction event.